Poet’s Notes: I taught a course in astronomy and geology called "Look Up, Look Down" in a public school for gifted children for twelve years and I had a big 12" Dobsonian telescope during those years. The Orion nebula is spectacular, and Orion, Canis Major, and Canis Minor were and are my favorite constellations. During those years I ran five miles a day (or night.) 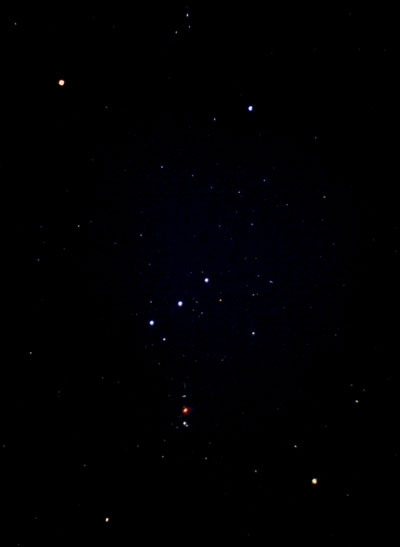 At night Orion seemed a lovely companion as I ran. One of my grandsons was about five-years-old at that time, so for him and my students, fanciful stories and facts about Orion and his companion big and little dogs were often told. I had a short story about Brad, my grandson, and Orion in a children's science magazine at the time, titled "Bradie Meets a Hunter in the Sky". My grandson was delighted, as I had published another story about his first camp out in my backyard. I called it "Carey's Campout" (I have always been a lover of alliteration! ), and he had been most disappointed that his name was not used. Editor’s Note: It saddens me that these myths and legends are becoming lost. I doubt many members of the millennial generation could point out Orion in the sky or know of Sirius (part of Canis major) anything beyond the reference to XM radio. I love the way the speaker addresses his/her child, and how the reader becomes that child.